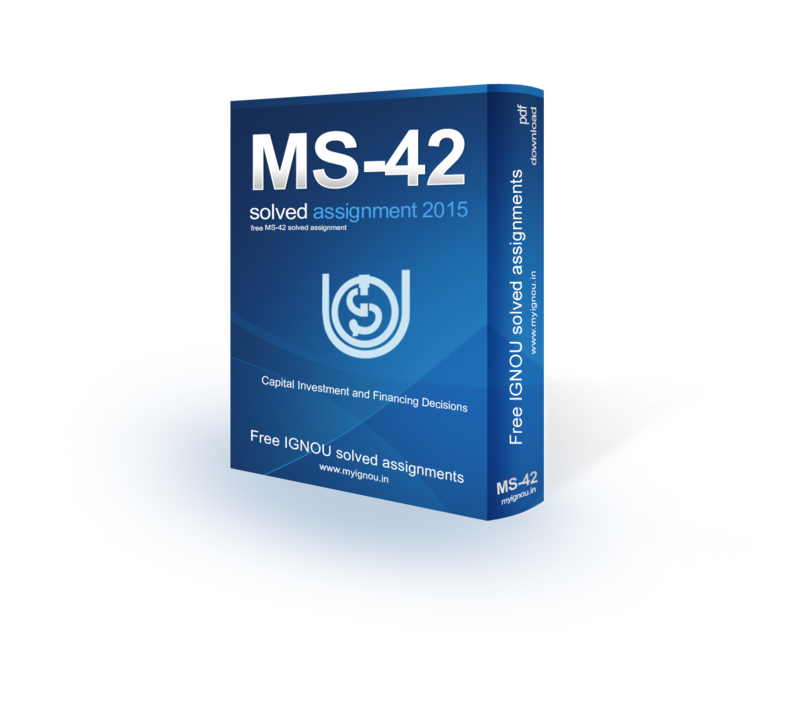 Welcome to IGNOU MS-42 Solved Assignment 2015 download section of myignou.in. Here you will be able to download IGNOU MS-42 (Capital Investment and Financing Decisions) Solved Assignment for (January - June) 2015 session for free exclusively on this website. To get other solved assignments like our facebook page. Q1. What do you understand by Economic Appraisal of a project? Discuss the various aspects of economic appraisal and explain their significance. • Designed to assist in defining problems and finding solutions that offer the best value for money (VFM). • A way of thinking expenditure proposals through, right from the emergence of the need for a policy, programme or project, until its implementation. • The established vehicle for planning and approving public expenditure policies, programmes and projects. Economic appraisal and economic evaluation are general names for a set of techniques that weigh up the costs of an action against the benefits that it provides. The distinction between appraisal and evaluation is that appraisal is undertaken before the action is taken, to decide what is to be done, and evaluation is undertaken after the action, to monitor its effects. However, except in certain circumstances this distinction is usually forgotten and the terms are used interchangeably in much of health economics. In recent years, the expression evaluation has become dominant in the health economics literature, but appraisal is used here. This will be explained below. CBA is a structured approach to help decision makers choose between alternative ways of using resources. Its main aim is to measure efficiency in areas where there is public involvement and there are therefore no market-based measures available to judge issues of efficiency. Equity issues should, in principle, be considered as part of an economic appraisal, but there are fewer formal techniques available to analyse this aspect. Share "IGNOU MS-42 Solved Assignment 2015"
Share this page (IGNOU MS-42 Solved Assignment 2015) to let others know about it!